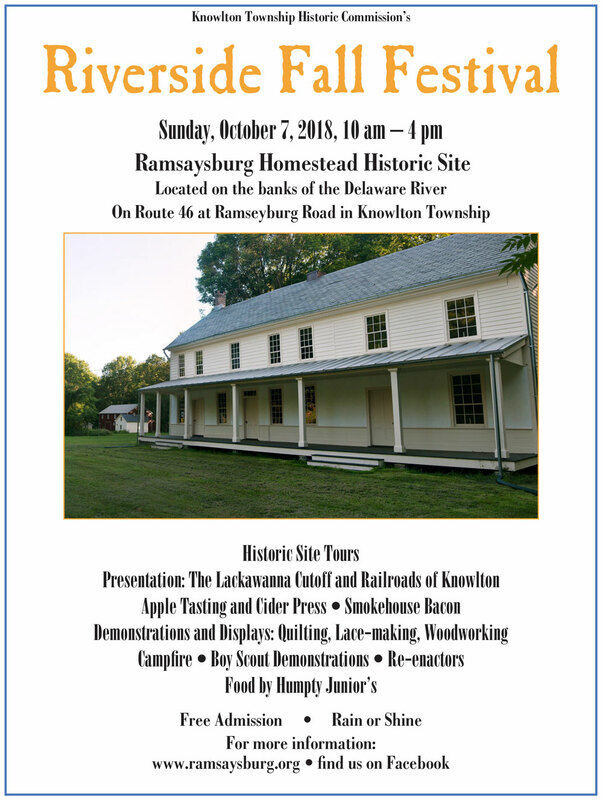 The Knowlton Township Historic Commission will host the annual “Riverside Fall Festival” at the Ramsaysburg Historic Homestead on SUNDAY OCTOBER 7, 2017 from 10am to 4pm. Named for Irish immigrants, James and Adam Ramsay, the 1795 settlement was a key location for trade along the Delaware River. Among the Ramsay brothers’ many ventures was a thriving lumber business. The river launching point where the homestead property now stands served as both a terminus for lumber rafts coming from upriver and for shipping downriver to the ports of Easton and Philadelphia. Prosperous trade continued throughout the early and mid-1800s until the development of the Delaware, Lackawanna and Western Railroad in the early 1850s by Warren County native John I. Blair. With the advent of the more economical train transportation, river commerce faded. The Commission hosts a series of annual events at the Ramsaysburg Historic Homestead, a twelve-acre riverfront property located on Route 46 at Ramseyburg Road. These include the Memorial Day picnic, the Riverside Fall Festival and Christmas in the Country, Plein Air Painting, as well as a series of summer Barn Concerts. An interpretive nature trail is near completion at the site, which also offers car-top launch access to the Delaware River for kayaks and canoes. 2018 Fall Festival activities will include: quilting exhibits, 15th Regiment NJ Volunteers – Company B – Reenactors, lace making, apple tasting, cider making, smokehouse demonstration with Myron Baley’s famous bacon, woodworking exhibitions, and more. Humpty Juniors will be offering tasty, seasonal refreshments. At two o’clock, Chuck Walsh, President of the North Jersey Rail Commuter Association will present a talk and slide presentation, “The Lackawanna Cut-Off and Railroads of Knowlton”. Chuck is a Knowlton Township resident and has been involved in the effort to preserve and reactivate the Cut-Off for over 30 years. He will cover the history of the Cut-Off—which is a rail line that runs from Lake Hopatcong, through Knowlton, to the Delaware Water Gap—and will also bring us up to date on the latest details on NJ Transit’s project to reactivate the line to Andover, NJ, and beyond. In addition, Chuck will touch upon the Cut-Off’s relationship to other rail lines in Knowlton, including a rail line and tunnel that was to have begun at Ramsaysburg that was never built.